The Remington 788 has long been considered the best shooting rifle for the money, the only thing holding it back has been its trigger. 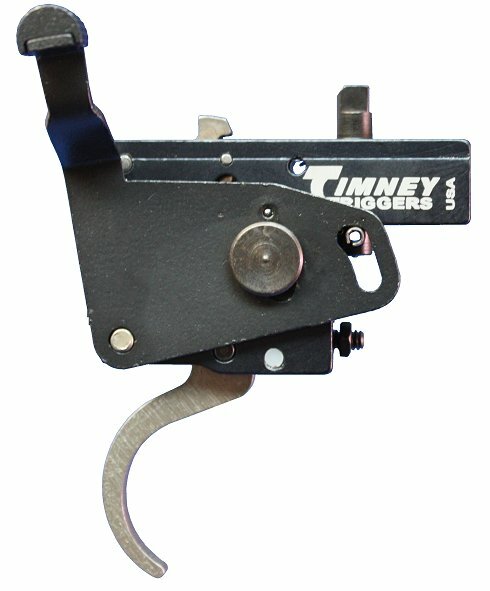 And even though the 788 has been discontinued, the Timney 788 trigger is a strong best seller. Adjustable from 1.5 to 3.5 lbs, the trigger comes with safety and bolt stop. View the 788 Instructions PDF. This is the second Timney 788 trigger that I have purchased from EABC and I am very happy with their service. The first trigger was for my 22-250. The install was pretty simple as you just have to remove a little material for the pin that sticks out the side of the trigger assembly as well as a little material for the safety lever. The second trigger is to be installed on my Remington 581. Based upon what I have read, this will require the same removal of material for the pin and safety lever as well as possible work on the bolt stop. This apparently varies with individual rifles. Overall The install on a 788 is very easy and the improvement over the stock trigger is well with the cost of the Timney. I love the Timney trigger. It required a little fitting in the wood stock. There is a small pin that pushes out on the trigger when the safety is engaged. A little wood removed there and all was in good working order. I recommend it for all rifles! Great trigger for the Remington 788. Very simple to install and works like all Timney products.....perfectly! The only game in town for the old Rem 788. Reports of problems with the original trigger/safety concerned me, so I replaced the factory trigger group. I've used Timney triggers in some hunting rifles before and found them to be quite good--maybe not as nice as the high end target triggers costing 3 times as much, but a significant improvement over most factory triggers. I'm very satisfied with the trigger. The installation was easy, and, it's vastly superior to the original factory trigger. I installed this on an older 788 in .243. It definitely was not a drop in replacement. I needed to remove a fair amount of wood for the safety lever to clear on the right side as well as on the left side. There's a pin that sticks out on the left side of the trigger mechanism when the safety is engaged which requires some inletting. It's not readily apparent, so if you're having difficulty engaging or disengaging the safety that pin may be the problem... it was for me. I also had to contact Timney to get a longer bolt stop. The bolt stop that came with it was too short, which allowed the bolt to be pulled out of the receiver without engaging the bolt release. I took a few weeks to get the part, but it seems to be working perfectly now. Other than that, this trigger is phenomenal. I haven't measured the pull weight but the setting that it came with feels just about right for a hunting rifle. It's super crisp with no creep, no take-up, and no over-travel. If I had another 788 I'd buy another one of these triggers. Great feel, the let off is very crisp & the break is clean. The adjustable pull is a good bonus. Liked it so much I ordered another! The bolt stop needs a little work. Not exactly a drop-in. Nice trigger though. Minor stock work required bur overall an easy install. Works great. I installed the new trigger assembly yesterday on my Remington 788. As I expected it was relatively easy to install--requiring only very minor trimming to get the safety mechanism to operate properly. I haven't had a chance to live fire it yet. This was my first time using EABCO and it will not be my last. Also, it is my first Timney trigger and I couldn't be happier, this was step one in improving my old 788. I look forward to purchasing from this company in the future.